After the numbers 1-12 have been formally introduced with a story that is fitting to each one, it’s time to bring the numbers together. Relationships are now formed and the numbers’ interactions can be characterized. If all 4 processes are presented together, from the very beginning, it makes this sort of lively exploration possible. One of the most effective vehicles for this is storytelling, costumes, and plays. When the children are encouraged to role-play the very different nature of each of the 4 processes, math takes on a much deeper value than if the various problems are presented abstractly and the children expected to learn by memorization and drill. ADDITION: Addi could be acquisitive, plump, GREEN and growing. She may also be seen as industrious and persevering since she stays with the job to the very end, until it’s finished. The temperament most suited to addition is PHLEGMATIC. SUBTRACTION: Subtra is sad, BLUE, and always losing things. Other aspects of his personality may be that he is generous, freely sharing and giving things away. The temperament most suited to subtraction is MELANCHOLIC. MULTIPLICATION: Multi is complex and busy, YELLOW and very happy to be so. He could also be said to be helpful, willing to take on more than his share. The temperament most suited to multiplication is SANGUINE. 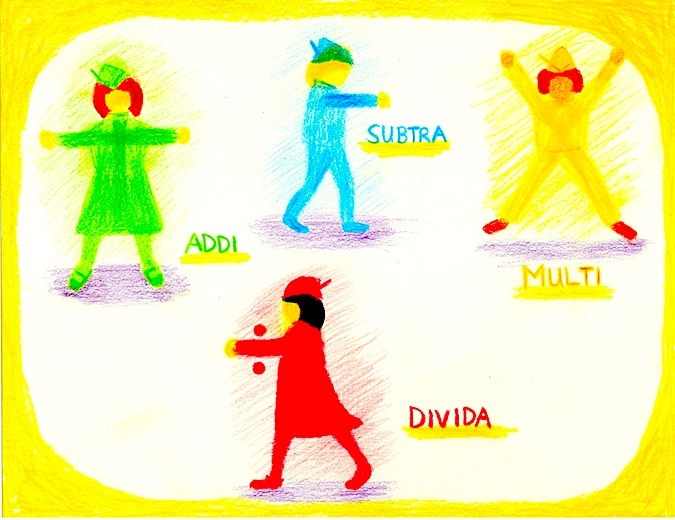 DIVISION: Divida is decisive, RED, and definite. she may be called upon to be an impartial judge because of her fairness and accuracy. The most suitable temperament for division is CHOLERIC. A little costuming and story creation is all that’s needed to convey the “mood” of each of the 4 processes. This concept goes a bit beyond math, since it can also be seen as a window into aspects of personality and character. The traits of the 4 processes can be a mirror, reflecting qualities that resonate on deeper levels. A bit about the 4 temperaments. An awareness of their qualities in children can be quite helpful in teaching. There are 4 temperaments, and we all have a bit of each one, with one or two that predominate. They are universal qualities or personality traits that tend to be more singularly individual at first. As the child matures, the dominant trait can be modified or balanced, thus blending somewhat with the others. When these qualities are mirrored back, as they can be with the 4 processes characterizations, it can promote deeper understanding and acceptance of self and others. So do have fun with these personalities, applying them within stories and plays that first show the qualities and interactions and then also bring the computation itself to life, as a lively interaction that every child can appreciate, understand, and comprehend. Numbers and their interactions can then be seen as friendly, approachable, and not least importantly, symbolic of much more than just everyday math.